I’m thrilled for the opportunity to join Pat Sloan, aka “The Voice of Quilting” for her American Patchwork and Quilting radio show next Monday, October 21, at 4:00 pm eastern. Among other things, we’ll talk about my background as a quilter. I hail from a long line of ’em, you know: Barbara Smucker, Esther Beechy McDowell, Mary Hostetler Beechy, and Sarah Stutzman. And that’s just on the maternal side. 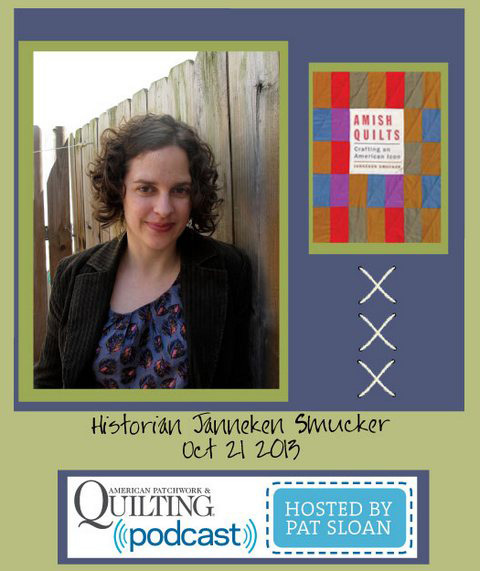 We’ll also talk about my experience studying quilts at the International Quilt Study Center & Museum at the University of Nebraska, where I earned my MA in Quilt Studies. Yes, that’s a thing! Pat has wondered how I integrate quilts into college history courses. I will be happy to answer that question, and many more. And I’m sure we’ll discuss my new book, which is available for pre-order and should be available for real in another week or two. Pat and I met at the Quilt Alliance’s “Not Fade Away” conference in July (home tickets still available!). She gave an excellent talk on how quilters and quilt enthusiast can best take advantage of social media. I know I learned a lot. And we discovered our shared passion for the stories of quiltmakers. Should be a great conversation, and I hope you’ll join us! Listen here live, or catch the podcast later!